phpBB • Firefox's BBCodeXtra add-on discontinued. Replacement? 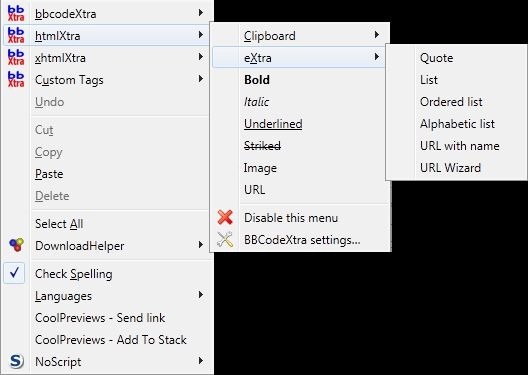 Firefox's BBCodeXtra add-on discontinued. Replacement? The new Firefox Quantum does not work with the excellent and indispensible BBCodeXtra addon. The developer is too busy to update it. Really, phpBB's built in BBcode editor is piss-poor compared to this add-on. Just one example: if you have a multi-line list of points you want to convert to a bulleted list, the add-on can do it with one click. Is there any other stand-alone program one can use as a decent bbcode editor that has some of BBCodeXtra's abilities? Last edited by mamba on Fri Nov 17, 2017 8:44 pm, edited 1 time in total. Re: Firefox's BBCodeXtra add-on discontinued. Replacement? It's really sad that a little piece of code called BBCodeXtra, written part time by an Italian, is waaay more useful than the BBCode in the default phpbb editor. And that is better than an enhanced bbcode editor how? I now use Chrome to post on phpbb. Chrome has a BBCode extension called bbCodeInsert, which is not as good but is better than nothing. Have an alpha version of a bbCode replacement (including clipboard commands). I do not see the point of using BBCodeXtra. Is good for nothing.